I'm in Haven: Simon Says... Stamp!! 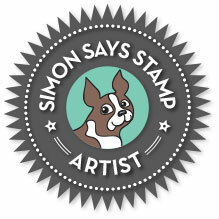 I am so honored and thrilled to pieces that I have been chosen to be featured on the Simon Says Stamp blog today!!!! I am a HUGE shopper at their online store....their store has the largest selection of products I have EVER seen, and I can shop for almost every company's lines on their store site! But... in recent times, Simon Says Stamp has come out with their own line of stamps and dies, amongst other items... and now much of my shopping with SSS is SSS!!! I seriously cannot get enough of their dies, especially!! A card that I made some months ago with one of their very cool dies, Circle Border, was seen by SSS's marketing director, Stephanie. She saw the card at Splitcoaststampers, I had made it for a sketch challenge. Stephanie contacted me and asked if she could feature that card on their blog and asked if I could make another card using the same die a different way....I was thrilled for the opportunity and at the challenge:)!! I came up with 2 very similiar but made totally different cards using the Circle Border die... both seeing the die on an angle. Below are my two new cards, check out all the cards at the Simon Says Stamp blog !! This one simply uses a striped foil paper, die cut, cut and layered. Lisa, I am so very thrilled for you. You have an incredible talent and you are by far one of the best designers out there in blogland. Your designs are always so breathtaking. I wish I had half your talent! CONGRATS! congratulations -- your work is amazing! A HUGE congrats on your feature - it's a big deal...their challenge blog alone gets 1000s of entries so they have a huge selection to pick from. Getting noticed is a BIG deal!! Saw your gorgeous cards over at SS. Love how you used the die on these two cards, simple and so striking! I can see why they contacted you, Fabulous cards! Congrats for the recognition! I love the cards you make, and I love this twist on using that great border die! I LOVE the red, white, & silver card, wow!! Yay! Found this through Pinterest, though I do follow your blog, too. I'm just soooo far behind in Google Reader. I tried this with washi tape instead of paper. paper is the better choice, but I'm still trying! HA! Some Pink with CAS-ual Fridays Stamps! CAS-ual Fridays Sneak Peek (Day 3)! CAS-ual Friday 75...Over the Edge! CAS-ual Fridays 74...Put Your Heart Into It! Peace on Earth...a Redo and a Give-away! CAS-ual Fridays 73...For the Girls!